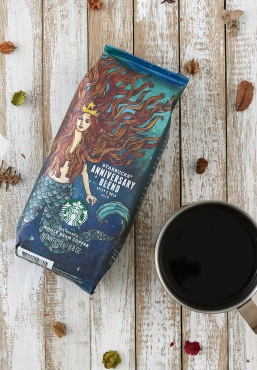 Starbucks® Anniversary Blend is about as distinctive as they come. This is a bold, confident coffee that we believe gets better every year it graces our palates. The secret to this blend? It contains aged coffee beans from Indonesia. You see, aged beans develop some interesting characteristics as they mature. Our trademark roast skillfully brings these qualities to the fore. The result is a deeply smooth, slightly spicy cup of coffee – full of body and extremely tasty. We created Starbucks® Anniversary Blend as a kind of gift for ourselves. But like they say, ’tis better to give than receive. We love nothing more than sharing this extraordinary coffee with people who are as mad for the bean as we are. You’re cordially invited to raise a cup in a birthday tradition as deep as our roast.